Why do I write a gardening blog? I have asked myself this question many times and I’ve also been approached recently by friends and acquaintances asking me the same question. First of all, I have found something I love to do. Write. For many years I floundered, wondering what my talent was in this world. I wrote my first post with the idea that if I hated the process of writing I would stop and try something else. But, I have to say, I love it. I love words and the English language and expressing oneself well and then feeling proud of your work when you are done. When I think of gardening and writing, I often think of Thomas Jefferson (also a redhead). He was not only one of our founding fathers of this nation but also a passionate gardener, architect, designer and writer. He wrote a journal about his gardening exploits that was later published under the title Thomas Jefferson’s Garden Book. Although some parts are a little difficult to decode, it is a wonderful book that I enjoy getting from the library from time to time. Jefferson wrote that some of his happiest times were spent in his garden at Monticello, his home in Virginia. The book is a mixed bag of many different things, such as lists of plants that he wanted to seek out, or vegetable seeds that he experimented with planting. Many times he wrote about the weather and how it affected the garden. Sometimes he wrote about problems he was experiencing in his orchard of fruit trees. Interesting stuff. In one entry, Jefferson wrote about receiving seeds of the Cherokee rose from the governor of Georgia and planting them “in a row of about 6 f. near the NE corner of the Nursery.” Seeds! I loved turning the pages to find out if the seeds flourished. Rose seeds! Amazing! Jefferson’s letters to friends ran heavily with reports on seeds and soil, experiments with plants, and notice that he was sending them something. He would often put together boxes of seeds and acorns and ship them to a friend for planting in their own garden. Inside the package, his letter would tell in minute detail planting instructions. Looking back, I like to think of Thomas Jefferson as the first Redhead Garden Writer. The ancestor to all of us garden writers. Maybe writing and gardening go hand in hand. Maybe this is why I write. 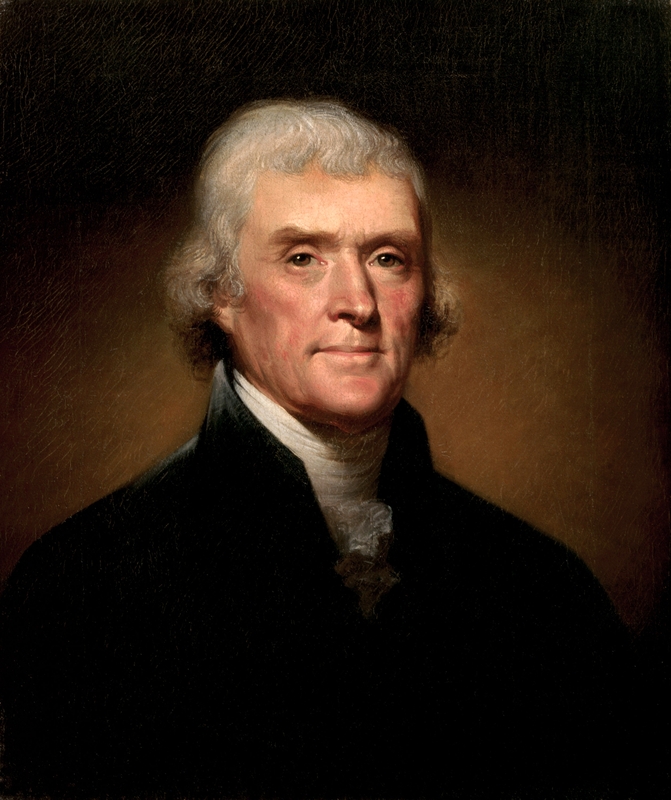 I would love to have seen Jefferson with a computer and the ability to research plants, order seeds online, and talk to fellow gardeners over the Internet. What a long way we have come! If you have the ability to visit Monticello, I highly recommend doing so. It is open to the public and you can enter the house and walk through the beautiful gardens. They have a book shop and nursery filled with plants and seeds for sale. My lovely fig tree and Sweet William flowers were purchased on our visit. The portrait of this great man at the top of this page was painted by Rembrandt Peale in 1800. The picture of Monticello was taken in 2010 by YF12s (CC-BY-SA).